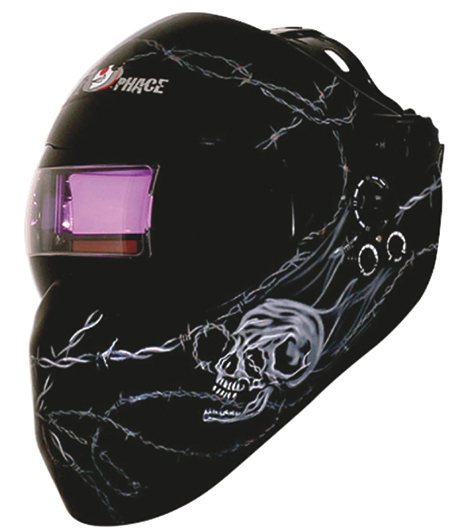 Save Phace, Dallas, TX, introduces the Extreme Face Protector Gen Y Series of welding helmets, which include an adjustable 4/9-13 auto-darkening filter with grind mode integrated into a 180-deg. viewing lens. Its face-forming design allows the user to access tight spaces, and because of its unique rounded design that doesn’t trap the welder’s breath, it reportedly stays 6 deg. cooler than other helmets. The Gen Y includes a replaceable sweat-absorbent headband, high-quality Halo headgear and a new flexible heat-resistant nylon helmet material. Three graphic options are available: Black Ice, Razor and Twisted Soul. Each model is ANSI- and CE-approved.